Dear Representatives! Get up, go out and attend your meeting! Slap on your Dior cosmetics, put on your Chanel necklace, pick up your Hermes bag… Gourmet restaurants have prepared an array of fine dishes from different regions for you, from the deep sea to wildlife, from Fujian to Hainan, from France and from Germany… The roads have all been blockaded for you… After you eat, remember to go to the Great Hall to clap! Raise your hands! Clap! Raise your hands! Clap! Raise your hands! My dears, you can even sleep at the meeting! Netizens’ scrutiny has been boosted by the Southern Metropolis Daily’s “billion pixel” photograph of the Chinese People’s Political Consultative Conference opening ceremony. 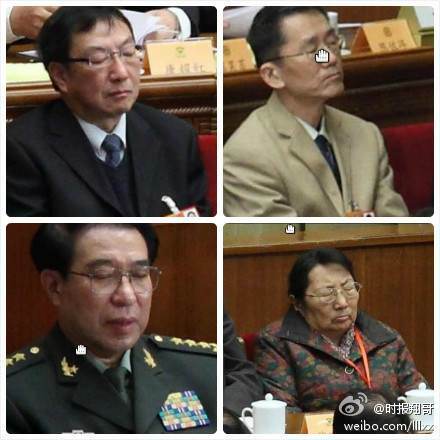 As chinaSMACK reports, Sina Weibo users have pored over this eagerly, pointing out attendees sleeping, reading, using smartphones or tablets, and even, in one case, paying attention. The widespread preoccupation with the proceedings’ opulence echoes last year’s survey of official’s luxury watches by “General Secretary of the Flower and Fruit Mountain”. The target in that case was corruption, revealed or at least suggested by timepieces worth several times the officials’ monthly salaries. But expensive baubles are a less reliable indicator of bribe-taking in an assembly whose richest members’ wealth far outweighs that of top-level US politicians. Instead, delegates’ clothes and accessories are being seen as signs of the country’s yawning economic divide. lin12y：Can they still speak on behalf of ordinary people? 我喺羊咩咩：Our country has grown strong! Those people’s delegates have been leading a decent life on our behalf! 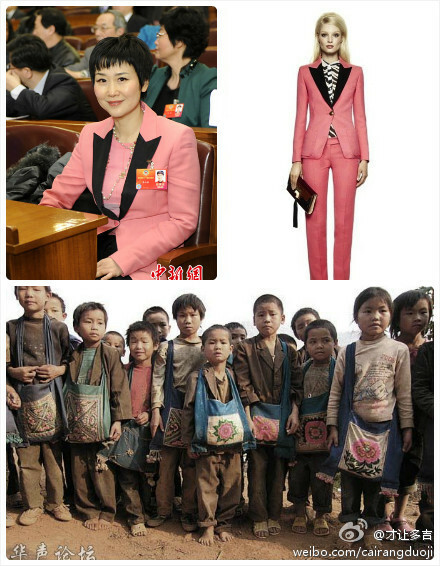 我是小卡车：Could be knock-offs from Taobao.